When Christmas comes around, don't hesitate: discover our selection of Christmas teas by brands such as Dammann Frères, Comptoir Français du Thé and Compagnie Coloniale. Treat yourself or a loved one. Every year, the biggest tea brands bring us their new creations, flavoured with Christmas tastes: fruity (orange, etc. ), spicy (cinnamon, etc.) or tasty (almond, gingerbread, etc.). A real pleasure to be shared after your holiday meals. This selection includes tea selection boxes, loose leaf tea and limited-edition tea boxes for the holiday season. Discover Dammann Frères' famous Christmas teas with this irresistible Tradition Gift Set. Christmas Tea (black tea with orange, caramel and pineapple flavours) and Christmas Green Tea (with orange, vanilla and spices flavours). 2 metal tins of 30g loose leaf tea in gift box. Discover this excellent deep blue gift box containing 2 tins of loose leaf tea (30g each) : Noël à Paris (black tea with cherry, almonds and gingerbread flavours) , Rooibos de Noël (a caffeine-free infusion with notes of bitter orange, black cherry and ginger). 2 tins of 30g of loose leaf tea in gift box. Discover this pretty bright pink box containing a charming tea infuser and 30g of 'Noël à Paris' by Dammann Frères : a sublime black tea with gingerbread, almond and cherry flavours. Discover the 'Season's Greetings' gift set from the Christmas collection by Dammann Frères. It contains a tin of 'Christmas Tea', 'Christmas Tea Vert', 'Rooibos de Noël' and 'Tisane de Noël'. 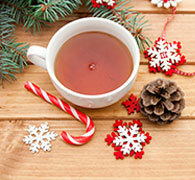 Discover this elegant Christmas Tea Selection by Palais des Thés. 6 individually-wrapped chiffon tea bags for each flavour (9 different blends including green teas, rooibos, black teas). A total of 54 sachets in a lovely presentation box. 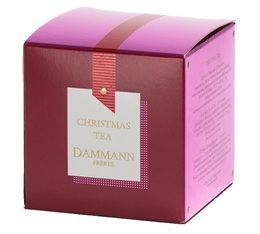 Discover 'Tisane de Noël' herbal tea from Dammann Frères. 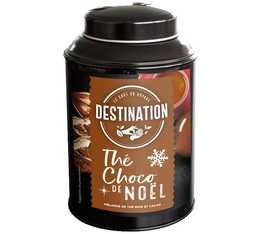 A blend with Christmas flavours : Chocolate, Liquorice, Cardamom, Cinnamon, Ginger. 1 box of 25 Cristal® sachets. Discover 'Rooibos De Noël' from the famous tea house Dammann Frères. A lovely rooibos with gingerbread, bitter orange and black cherry flavours. Caffeine-free. 1 box of 25 sachets by Dammann Frères. Discover 'Rooibos De Noël' from the famous tea house Dammann Frères. A lovely rooibos with gingerbread, bitter orange and black cherry flavours. 100g loose leaf in special tin. Discover 'Noël à Paris' by Dammann Frères : a sublime black tea with gingerbread, almond and cherry. A great festive tea in a lovely metal tin. 100g loose leaf tea. 'Noël Boréal' by famous French tea house Comptoir Français du Thé is a flavoured black tea with notes of orange, Xmas spices, apple... Ideal with a slice of cake ! Box of 20 sachets. 'Noël en Vert' by Comptoir Français du Thé is a Sencha green tea with Xmas spices and almonds flavours, sprinkled with sparkling stars. Bag of 15 sachets. Discover a flavoursome black tea blended with orange, spices and flower petals. An explosive and magical blend with all the colours of a Christmas in Alsace ! Bag of 15 sachets. Discover this gift set of 3 baubles filled with flavoured black tea by Compagnie Coloniale. This black tea reveals notes of cherry and almond. 1 bauble contains 10 sachets. Discover 'Noël aux Bermudes', a rare and elegant pairing of black tea and jasmine green tea, blended with tropical notes of pineapple and cardamom. 100g loose leaf tea in a sealed packet by Comptoir Français du Thé. Discover this set of 3 baubles filled with tea bags from Compagnie Coloniale. This box includes 3 Christmas baubles with 10 tea bags each. 3 different teas with Xmas flavours: Thé de Noël, Étoile d'Orient, Thé des Neiges. Discover this gift set by Compagnie Coloniale. 3 different loose leaf teas with Xmas flavours : 'Thé des neiges' (white tea, 25g), 'Thé de Noel' (black tea, 30g) , 'Etoile d'Orient' (green tea, 30g). Each tea is presented in a lovely tin with a double lid to maintain freshness.